Tue., Dec. 4, 2018, 8:49 p.m.
ELON, N.C. – Alex Hunter scored all of his 18 points in the second half, and No. 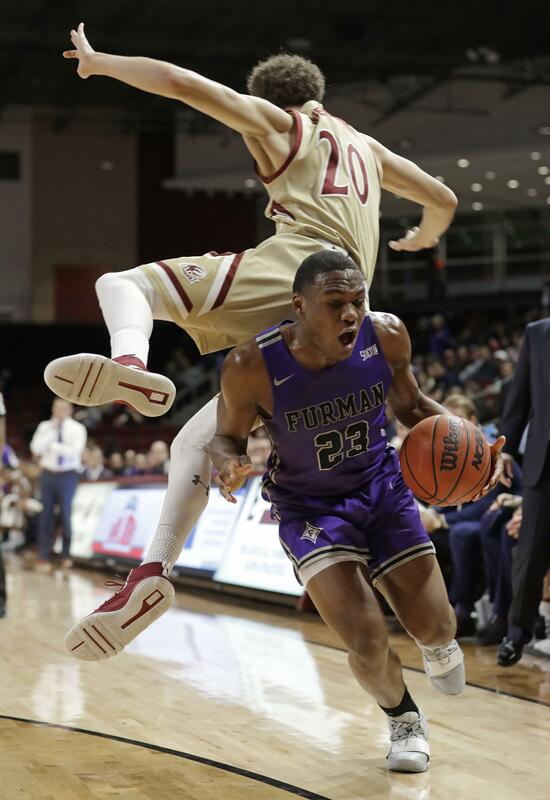 25 Furman won its first game since the program’s debut in the AP Top 25, 98-77 over Elon on Tuesday night. Steven Santa Ana led the Phoenix (3-6) with 21 points and Tyler Seibring scored 17 of his 19 points in the second half for Elon, which pulled within 55-52 on Simon Wright’s 3-pointer with 12:22 left. But the Paladins responded with a 13-2 run to take a 79-61 lead on Jaylon Pugh’s 3-pointer with 6:29 remaining. LAWRENCE, Kan. – Dedric Lawson had 20 points and eight rebounds, and Kansas beat Wofford after center Udoka Azubuike left with a right high-ankle sprain. EVANSTON, Ill. – Ignas Brazdeikis scored 13 of his 23 points in the second half and Jordan Poole made two big plays in the last 2 1/2 minutes to help Michigan hold off Northwestern. AUBURN, Ala. – Austin Wiley scored 14 points, Samir Doughty added 13 and Auburn won despite a season low in points. UNC Asheville (1-7) was led by Luke Lawson’s nine points off the bench on 3-of-4 3-point shooting. Leading scorer DeVon Baker struggled his way to four points, 11 below his season average. He made 2 of 10 shots and committed nine turnovers. STARKVILLE, Miss. – Lamar Peters scored 27 points, Reggie Perry added 15 and Mississippi State pulled away from McNeese State in the second half. Published: Dec. 4, 2018, 8:49 p.m.